Low Flow Toilets have tons of features today, some more beneficial than others. What to look for when selecting a water saving toilet. Bathroom eco water systems include low water toilets. Single flush or dual, round or oblong bowl, high seat or low, gravity flush or pressure assist, will replacement parts be easy to find? There are a lot of things to consider when choosing a low water toilet. And the longer it'll be before it's ready for the recycle bin, the greener the product is overall. The amount of water you'll save depends on how old your current toilet is. Toilets installed before the 60's used as much as 7 gallons per flush, after the 60's it was reduced to 5 gallons and in the 80's it was reduced still further to 3.5 gallons per flush. More current legislation (1994) has reduced the per flush volume to 1.6 gallons and dual flush models offer an option as low as 0.8 gallons for a light weight flush. Below we'll discuss a number of options available in the low water toilet line-up but the bottom line is that the toilet does what toilets are supposed to do; sweeps away the deposit, with the push of a lever, into an unseen (and unsmelled) space in the netherworld. At the risk of being crude, if you can't get the turd (and its evidence) out of the bowl, it really doesn't matter about the other fine features the toilet might have. When renovating an old bathroom remember that most new model toilets require a 12 inch rough-in. There's lots to think about when choosing a low water flow toilet, below are some options and the pros and cons of each. 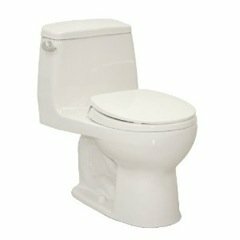 Dual Flush - Single Flush Single flush low water toilets use 1.6 gallons of water per flush, every flush. Most dual flush models offer a selection for less than 1 gallon (usually .8 of a gallon) as well as the 1.6 option. Round vs Oblong Comfort versus space. Round bowl models are more compact and will fit in a smaller space. Oblong bowls are more comfortable but need a larger area. Pressure Assist A tank of air situated inside the water tank is pressurized when the water surrounds it. On flushing, the air is expelled with the water creating greater momentum. The first designs to incorporate the pressure assist option made a startlingly loud whooshing noise when they were flushed. These days they're almost as quiet as their gravity fed counterparts and very efficient at evacuating the bowl. Gravity Flush Quieter than it's pressure assisted counterpart the gravity flow system relies on superb design to push the water from the bowl up and over the trap. Seat or No Seat? In most cases the seat is considered more of an accessory than a necessary part of the toilet. Most low flow toilets do not include the seat. Seat Height The height of the bowl, from floor to bowl rim, ranges from 14 to 19 inches. Seniors find the higher seat easier on joints and young families like a shorter version so that growing family members have easy access. 16 inches is the most common height. Corner Tank Water Saver Dual Flush - Corner Toilet fits at an angle in a corner creating a roomy feel and a decorator's touch in your bathroom. The dual flush buttons deliver 0.8 gallons for the small flush and a very adequate 1.6 gallons for a more serious flush. One Piece or Two Some models sell the tank and bowl separately, others are all one piece . One piece is easier to clean and a sleeker profile but they're more expensive. Two piece models are most common and the tank bolts on to the toilet bowl when its installed. Read customer reviews on the internet of all of the low flow toilets you're considering, even if you don't intend to buy online. The online shopper's biggest advantage is access to reviews from people who own the product. Use them, they'll point out red flags. Consider the complexity of the toilet design. Features like pressure assist and dual flush, although they can be very helpful, add to the difficulty in maintaining or making small repairs to your toilet yourself. Expect to pay anywhere between $150.00 and $700.00 for your toilet, most fall between $300.00 and $450.00 USD. For super low water use consider a composting toilet. Visitors to our Low Flow Toilets page may also be interested in the following pages. This tip changed my life! © GoingGreen-atHome.com 2009 - 2012 All Rights Reserved.